Microscope World Blog: Introducing Swift WiFi Microscopes! The Swift WiFi microscopes create their own wireless network that any Android or iOS device can connect to. The microscope also has on-board software that can be controlled with a web browser on a computer for image capture and measurement. Students can use their smart phone, tablet or computer to view the images seen under the WiFi microscope. Streaming images are sent to up to 6 devices without the need for a router. The Swift WiFi microscope generates its own WiFi signal and can be used separate from your existing network. You can download the free MotiConnect App at the Apple App store or at the Google Play store. The biological digital WiFi microscope includes a built-in 1.3 mega pixel camera and allows capture of both live images and video. 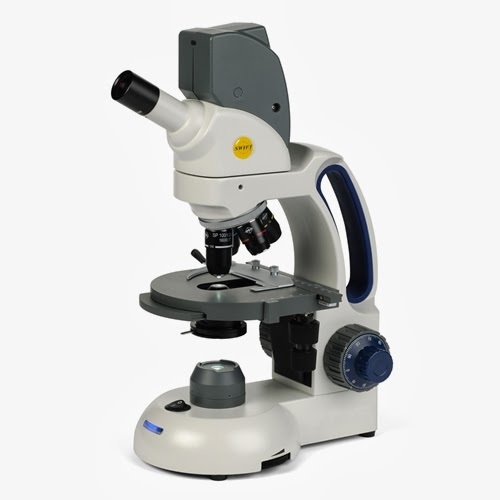 View the Swift WiFi microscope here.